The closest paddling gear store to the Middle Fork of the American is the Sierra Outdoor Center. They’re on Lincoln Way, very near to Hwy 80. This casual, one-of-a-kind store has a wide range of gear for rafters and kayakers. (888) 502-7066. REI Roseville has lots of gear needed for boating and sells sundries like sunscreen and nose plugs as well as bigger ticket items like dry bags, PFDs, and dry suits. They also rent basic camping gear like sleeping bags and tents–useful if you’re going on an overnight trip with an outfitter. (916) 724-6750. If you are looking to demo a kayak or rent a drysuit, the Sierra Outdoor Center in Auburn has a wide selection to choose from. 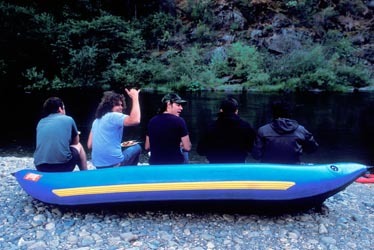 Paddlers will find lots of gear options in Sacramento, which is 30-40 min from the Middle Fork of the American River. California Canoe and Kayak has been in Sacramento since the early 1970s and has a large selection of boating gear at their store in Rancho Cordova ). REI is always a good option as well for gear and camping rentals. Kayakers might also want to check out Kayak City.